We all have these types of cards in our collection. The kind that are cool for some reason or another, yet mean nothing to us. I got these cards right out of the packs years ago, and they are 2 of my favorites. Both cards came from the 2005 Fleer Classic Clippings Set. The Marcus Giles card is cool because there is dirt on the swatch, and I like that. 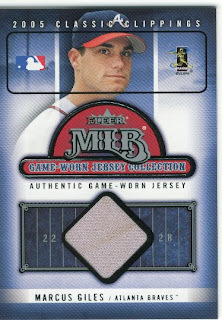 This is the only card I think I have ever pulled, that actually looks like it was "game-used". The Brian Giles was my first ever patch card, so I think for that reason alone it has a special place here. Anyone else have random favorite game-used cards? Or remember the first one you ever got? Shout it out and entertain me. 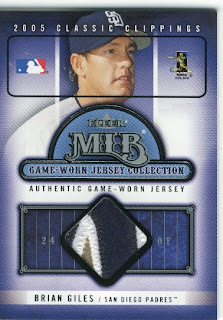 The first uni card I ever pulled, I think it was Joe Crede. It was an Upper deck card, and the cloth of the uni did not fill all of the window. So one side of the square shows the frayed edge of the game worn jersey. See, that sounds like alot more fun than pulling a pure white swatch. I wish they all had dirt on them. Love the patch card. I'm a sucker for multi colored patches. It looks great.